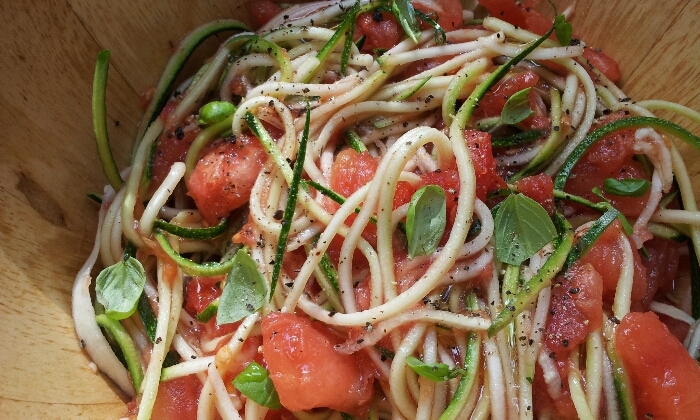 A Normandy Kitchen: Tomato and spaghetti of courgette salad. Two ripe giant 'beef heart' tomatoes or six ripe normal ones, cores removed and plunged into boiling water for twelve seconds and dropped into iced water. Peel the tomatoes and remove the seeds, cut or tear into pieces. Cut two courgettes with a vegetable 'spaghetti' cutter or just grate. Cut just up to the seeds and discard the core. Dress with rice vinegar (or your favourite vinegar) and olive oil (1 to5). Just before serving season well and mix in a small handful of basil. This looks tasty. I have all the ingredients in my garden, but they are all far from ready to use. Such a late year this year for many reasons, including the weather.